After running the numbers I realised that I wasn't going to be able to run the 200C blanket from domestics mains supply so a change of plan. 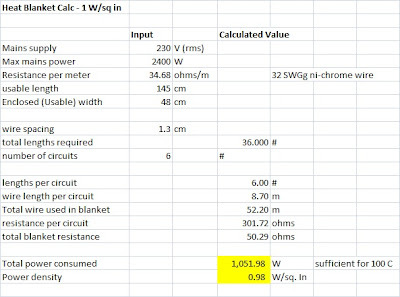 I'm going to make 1 kW blankets that should be enough to reach 100C which should cover of all the epoxy curing needs. The dye sub heater will have to go on the back burner for a while. 150 x 50 cm usable area. 6 separate circuits in parallel each with 6 lengths of wire in it. I bought some 32 gauge wire (0.2mm dia) on ebay from the US which has 34.68 ohms/m resistance for about $4 for 10m. I've ordered 2 kg of Mold Max 40 from RoweTrading.com.au in South Australia for around $50/kg. This is a condensation curing ( tin catalyst as opposed to platinum) 2 part silicone rubber that has a max temp rating of 205C which is more than enough for the spec'd down blankets. I had originally order Mold Max 60 which is rated to 293C but changed that after running the numbers on the hotter blanket. BTW the 40 and 60 refer to the hardness of the cured rubber on the Shore A hardness scale. 40A hardness is about the hardness of a pencil eraser, 80 is the hardness of a car tyre so 60 is in the middle. On skibuilders.com is seem that the blankets are coming in under 3mm or so. There are typically 2 layers of fibreglass with the resistance wire in between. This gives electrical insulation and makes for a strong finished product. 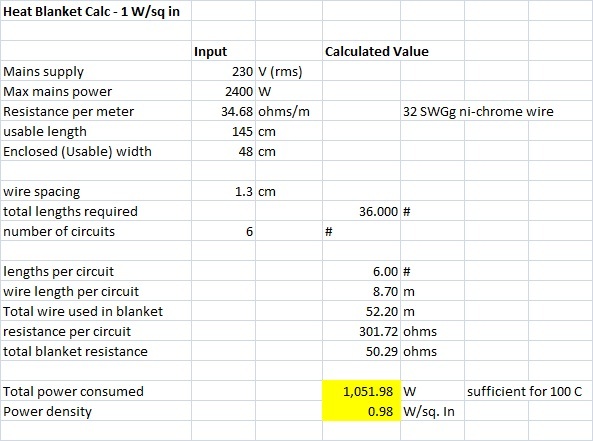 At the lower temperature of 100C it should be ok to solder the resistance wire to a mains input wires. I believe that solder typically melts at around 170C or so. The best idea on skibuilder.com seems to be crimping the resistance wire into aluminium tubes and soldering the tubes onto a bus bar of some sort. Still seeing if there is an easier way to do this and make sure the wires remain well insulated from each other.